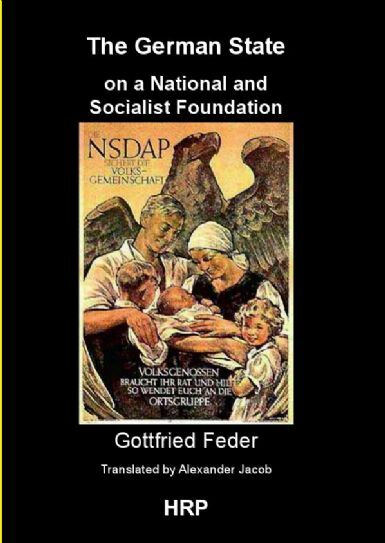 The German State on a National and Socialist Foundation - Gottfried Feder. First published in 1923, before Hitler‘s rise to power, this first ideological formulation of the National Socialist state by Gottfried Feder highlights the early economic focus of the NSDAP in creating a state freed from the fundamental Jewish economic distortions of Aryan society through the credit system of the banks, with its exploitative interest on large loan capital, and the stock-exchange system, with its alienation of capital from work. The National Socialist solution to the debilitation of Aryan nations is seen to consist in a strengthening of the state on the basis of social justice whereby the state assumes control of its economy through nationalisation of its central bank and supervised distribution of its industrial goods. Such a state naturally also demanded the exclusion of exploitative and anti-national communities like the Jews from the public life of the German nation.